It’s time to start thinking about Easter baskets and all the goodies you can fill them up with. Nothing is quite as exciting as watching children open their Easter baskets, but, what if you are on a limited budget this year? The good news is you can still fill those Easter baskets to the brim without going overboard on your budget. 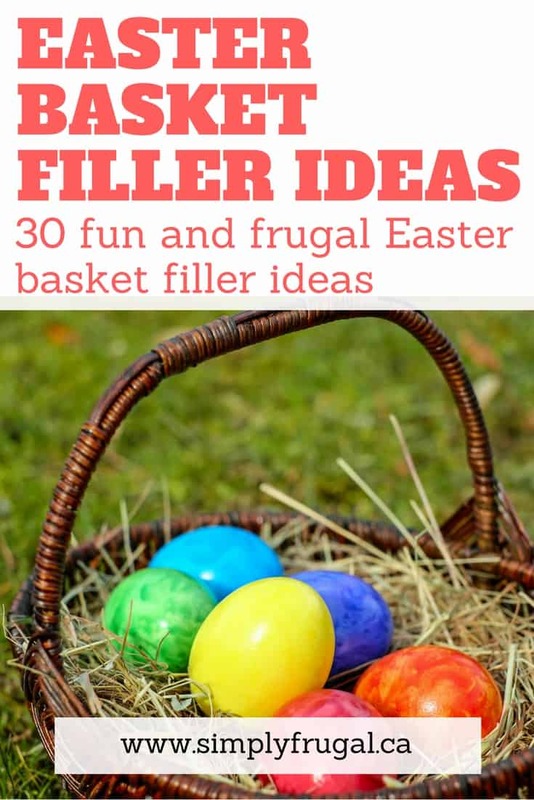 Look at 30 fun and frugal Easter basket filler ideas so you can fill those Easter baskets without breaking the bank! You will find lots of ideas perfect for making your Easter baskets sweet and special. You will find that most of these items can be found at your local dollar store. In fact, some of these items actually cost less than a dollar. Choose a few items of interest and see how easy it can be to build a basket for $10 or less. 1. Chapstick or lip gloss. Chapstick is perfect for both boys and girls. Little ones will love their own lip gloss. Now that spring is here, visors or sunglasses will no doubt get some use. You can’t have an Easter basket without some candy and edible treats, right? For a healthier option, try fruit snacks, nuts, or even dried fruit for a snack. Kids love trading cards and playing cards, both of which can be found at your local dollar store. Kids love getting new toothbrushes. Pair them with kid friendly toothpaste. This will no doubt encourage some bath time fun. Girls will love having a fresh selection of hair accessories. Choose from a wide variety at your local dollar store. With spring’s arrival this will allow kids to get out and get active in the yard and garden. Find some fun spring or Easter themed socks to toss into the Easter baskets. Dollar stores have all sorts of little character figurines which many kids love collecting. Find kid themed plates, cups, and dishes. Kids enjoy having their own dishes to snack on! These are perfect for after school snacks and kids will love having their own supply. This idea is perfect for the little fashionista. Dress up your dinner table with some kid’s themed placemats, also found at most dollar stores. Grab some bunny ear headbands at your local dollar store for the perfect Easter treat. Make bath time fun with kid themed sponges and washcloths also found at your local dollar store. Puzzles are perfect for keeping kids busy on a rainy spring day. Find some fun children’s books perfect for cuddling up with each night. Keep kids busy with an assortment of coloring and activity books and crayons. Let the little artist out of your child with an assortment of crayons and other coloring supplies. Kids never get tired of stickers. Give them a fun spring selection to get creative with. These are perfect for kids to sketch their thoughts and doodles on. Kids love attaching these to backpacks! Encourage fine motor skills with an assortment of dough and accessories. For the budding artist, craft supplies are always fun. Let kids get creative with their own jewelry making supplies. Sidewalk chalk is perfect for staying busy on a spring day! Summer is just around the corner and kids will no doubt love having beach toys on hand. Is anything more fun (and silly) than silly string? As you can see, these Easter Basket options are fun and affordable. Head to your local dollar store and see these treats and more, perfect for filling up your Easter baskets this year! I’d love to know, what do you put in your kids’ Easter baskets each year? Let me know in the comments below. I was having some stress about giving my kids too much chocolate or risk having more “stuff” come into the house. Then I realized that I don’t have to do either. We will have a modest chocolate egg hunt with high quality chocolates so they don’t get a taste for cheap waxy chocolate, and one bigger bunny or egg (to share with parents of course), and that’s it. No presents, no stuff. Keeping the hype down.